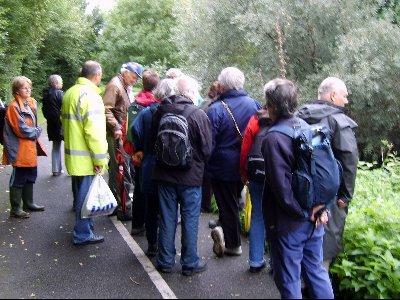 On this brand new walk in memory of QWAG’s former chairman, Ray Manchester, we’ll criss-crossing ten bridges over the Quaggy as we explore the river’s past and glimpse its possible future. QWAG work over the years means it has become one of the first urban rivers to start being released from its concrete prison to become a free river. Starting near Lewisham station, by the noticeboard where the Quaggy meets the Ravensbourne – both imprisoned in deep concrete channels – as we move upstream, crossing the border into Greenwich, we’ll take time at each bridge to view the engineering feats and failures and historical crossings while enjoying green space old and new on the way. Bring your own picnic lunch to enjoy at the end of the walk in one of the country’s first and most spectacular river restorations – the superb wetland site of Sutcliffe Park. Here you will see images from QWAGs first walk, in the park long before it was restored. Marvel at the changes, the restored river and fabulous wildlife, since those early years.